County clerk Jim Fielder announced today he’s extended early voting hours. Early voting is now open from 8:30 a.m. to 6 p.m. Monday through Saturday and from 1 to 5 p.m. Sunday at the Curry Building, 238 W. Seventh St. It ends at noon Nov. 3. “I thought, with the amount of interest we’ve had in this election, we should give people every chance they’ve got to get in and vote,” Fielder said. He said he’s worried that heavy interest in the November presidential election, coupled with a move earlier this year that downsized the number of county precincts, might mean lines at the polls on Election Day. Extending early voting hours could help alleviate that crunch, he said. More than 11,000 people have voted early so far in the county’s Nov. 4 election, surpassing the number of absentee ballots cast locally in the 2004 presidential election and breaking the county’s early voting record set in the May primary, local election figures show. As of today, more than 700 people had voted early in person and election workers received more than 100 ballots by mail by 4 p.m., elections supervisor Jessica Sears said. About 44 percent of registered voters voted in the May primary, and Fielder has predicted a better than 50 percent turnout for the November election. More than 88,000 people have registered to vote in Monroe County, according to election records. 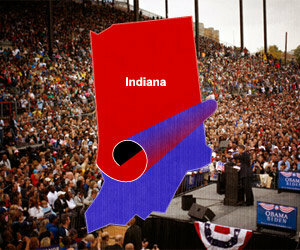 The most noteworthy result for Obama is in Indiana, where PPP has him two points ahead. One noteworthy feature of Indiana is that it has had rather low turnout in recent elections, perhaps because neither party has really bothered to campaign there. As such, likely voter models which are rooted in past voting history may be unreliable. And according to Tom Jensen, Obama has a 68-24 lead among voters who did not cast a ballot in 2004. These are the sorts of statistics that the Obama campaign is looking at, and they’re why they remain very engaged in the Hoosier State. We have very low voter turnout because it is such a republican stronghold. This year we’re giving it a real run for it’s money! Oh, and one more side note…Indiana is one of the first states that reports its numbers in the general election. Our polls officially close at 6pm. IF, and it’s still an IF…if we’re standing in the midwest as a blue state when you turn on your televisions on election night. Democrats can open the champaign, it’s over. Indiana as a blue state is a sign of the apocolypse…and all the Republicans might as well drink too, it’s the only way you’ll be able to swallow the landslide that will be election night with a Blue Indiana.